Normandoh.com seems to be a browser hijacker since it may settle in by changing the browser’s preferences. Our researchers also say it could be spread through unreliable channels, and some users might even receive it without realizing it. Another thing we believe users should know about the application is that it is possible, it could show unreliable advertising content. For more information about the browser hijacker, we encourage you to read the rest of this article. Should you decide you no longer wish to continue using Normandoh.com, we encourage you to erase it with our provided deletion instructions available below or a reliable antimalware tool of your choice. Users who have more questions about this application can also leave messages in the comments section. According to our researchers, Normandoh.com might be distributed through bundled software installers. It means the application could be offered together with other unreliable programs. Such setup files might be spread through torrent and other untrustworthy file-sharing web pages. It is crucial to know some bundled installers show additional suggestions only if the user chooses advanced or custom installation. This is why we recommend selecting this option whenever possible if you do not want to receive unwanted tools unknowingly. There is also a possibility the browser hijacker could be spread via suspicious pop-ups or similar advertisements. Therefore, provided you do not want any questionable software on your computer, we advise staying away from suspicious ads, especially if they offer tools you have never heard of. We do not say you will necessarily come across unreliable advertising content while browsing with Normandoh.com, but there is such a possibility. 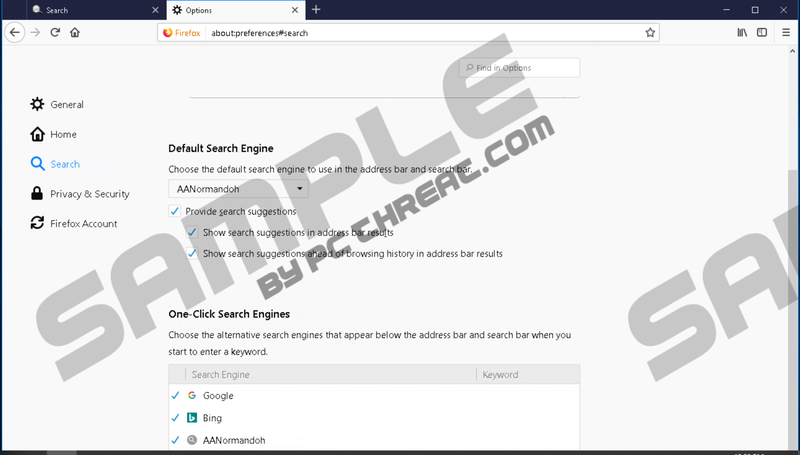 Naturally, knowing there are more reliable search engines to choose from, our researchers advise not to take any chances with this browser hijacker. If you decide to get rid of the application, you have a couple of options. The easiest one is to install a reliable antimalware tool and let it remove Normandoh.com from your browser. The other option is to try to erase the browser hijacker manually. This task could be rather complicated. Our researchers say it is because the user has to remove the application, the threat came with, and unfortunately, we cannot know its title. What we suspect is it might be some browser extension, probably the one installed right before the browser was hijacked. Therefore, for users who wish to remove Normandoh.com from the browser, we would advise resetting their browsing applications. Doing this should erase all suspicious extensions or other content that could be related to the browser hijacker. The instructions located below this article will explain how to reset Google Chrome, Mozilla Firefox, and Internet Explorer, so if you need any help with this task, feel free to use them. Of course, if you do not want to reset your browser, it would be best to employ an antimalware tool. Keep in mind, if you pick a reliable tool, it may not only help you clean the system this one time, but also guard it against threats you might yet encounter in the future. Choose Help from the upper menu bar. Press Troubleshooting information and select Refresh Firefox. Click Refresh Firefox again and choose Finish. Scroll below once more and choose Restore settings to their original defaults. Quick & tested solution for Normandoh.com removal.